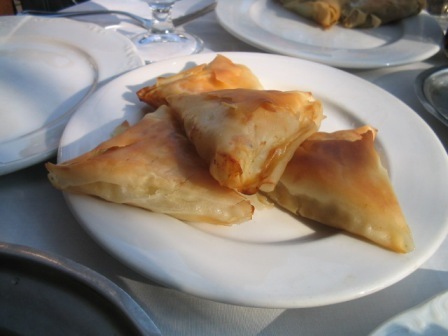 Tiropitakia, little cheese pies, come in many shapes and sizes here in Greece. Little diamonds, squares, cigar-shaped, folded triangles, large family-sized trays, spiral rolls – you name it. I espied these more familiar triangle-shaped tiropitakia in my wanderings near the Acropolis. Here’s my recipe, from ‘Quick Vegetarian Dishes’. Feta cheese is a white, dry crumbly cheese that can be made either from cows’, ewes’ or goats’ milk. It is matured in brine to give it a sharp acidic and salty taste. These small triangles of crisp filo pastry with a savoury soft centre contain a mix of feta and haloumi cheese. They’re ideal for dinner parties as a pre-meal nibbler. Makes 16. Grate the feta and haloumi cheese into a bowl and mix in the thyme or mint, the pepper and the roasted caraway seeds. Cut the stack of filo sheets lengthwise into 3 even strips with a sharp knife. This will give you 36 strips of pastry. Brush one strip with smears of butter or oil and place a second strip on top. At the base of this, spoon on a small tablespoon of the cheese mixture. Fold the bottom edge of the pastry up to form a triangle over the filling. Continue to flip the triangle over and over, working up the pastry strip until it is all used up, forming a little triangular parcel. Repeat this procedure until all the pastry and cheese is used. Place the parcels on a baking sheet and brush with the remaining butter or oil. Bake in the hot oven for about 15 minutes, or until the parcels are crisp and golden.